Without statewide leadership on climate change, some of Florida’s coastal communities are forging ahead on solutions. West King Street in downtown St. Augustine is home to quirky shops, fine dining and more than its share of ice cream parlors. After a stroll and some shopping, visitors may find themselves near the Castillo de San Marcos, a historic Fort looking out over the Matanzas Bay — and walking along the new $6.7 million seawall. Although it serves as a sidewalk for pedestrians, the seawall is far from just a tourist attraction. It’s built 12 feet into the water from the original 1800s seawall and uses concrete and reinforced steel to protect against rising tides and storm surges. St. Augustine, the first European settlement in the United States dating to 1565, is also one of the earliest to fortify itself against sea rise — in part because it has so much history to lose. Many of the city’s historic assets are close to the coast, and an increase of a few feet could permanently inundate portions of those historic districts. Since 1950, Florida’s sea level has risen by eight inches, a rate that has sped to one inch every three years, according to SeaLevelRise.org. For cities and counties located just a few inches above sea level, “over time, sea-level rise and flooding are expected to destroy, or make unable, properties and public infrastructure,” according to the federal government’s Fourth National Climate Assessment released last month. In any number of studies, Florida stands to lose more real estate and other economic value to climate change than any other state. Researchers in Science magazine last year estimated Florida could lose more than $100 billion in GDP by century’s end. Across Florida, some coastal cities are taking measures from installing flood pump stations to raising roads and houses. But response is uneven. While municipalities as small as St. Augustine and metro areas as large as Miami are working to prepare for drastic change in landscape, other areas of coastal Florida have so far turned a blind eye to the changes happening around them. Part of the problem is continued polarity on climate change at the highest level of state and federal government. Former Florida governor, now U.S. Senator Rick Scott, famously would not say the words “climate change.” Incoming Governor Ron DeSantis’s environmental platform includes a commitment to “emphasize smart growth and resilience to rising sea level for South Florida.” But the platform does not include the words “climate change.” It also does not acknowledge that sea rise is happening along the entire 1,350-mile coastline; not only south Florida. Two-thirds of Florida’s 20 million residents live in coastal counties. Much of the work to protect them has fallen on the shoulders of local governments — especially when response may need to come faster than statewide politicians are willing or able to act. St. Augustine’s efforts to defend itself from the sea date to the 1600s, when the threats included marauding buccaneers. 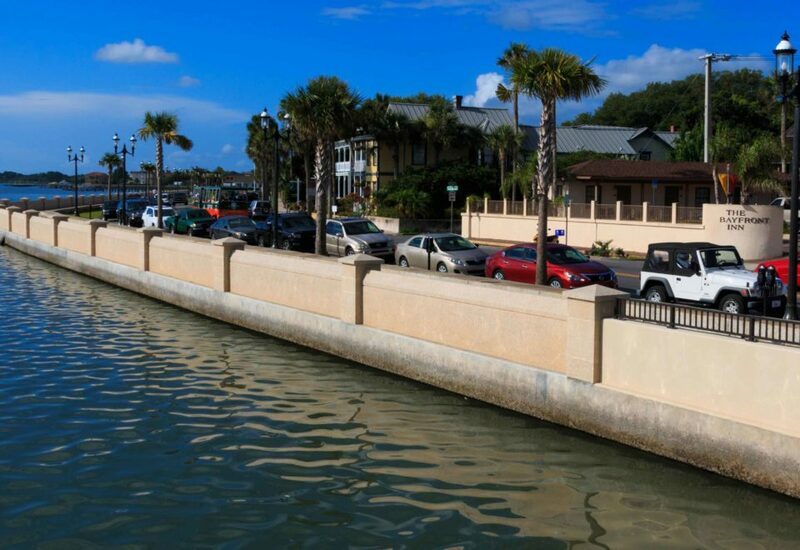 Today’s work, such as this $6.7 million seawall, aims to protect neighborhoods — and historic assets such as the original coquina wall — from sea rise and other climate change threats. Broward, Miami-Dade, Monroe, and Palm Beach counties united in January 2010 to form the Southeast Florida Regional Climate Change Compact, which “represents a new form of regional climate change governance designed to allow local governments to set the agenda for adaptation,” according to the compact website. The compact was designed as a template to be used across the state. Florida has 3.5 million people at risk of coastal flooding, with those numbers rising by an additional 1.1 million by 2050, according to StatesAtRisk.org. The compact establishes a common set of sea-rise projections — six to 10 inches by 2030, two and a half to five feet by 2100 — as a base to set response goals for agriculture, transportation, water, energy and more. So far, 35 cities have signed on. “We’re using common, science-formed planning projections to guide public policy; we’ve built quite a lot of resilient infrastructure and we’re actively learning from each other as we get ready to build more,” said Steve Adams, director of urban resilience for the Institute for Sustainable Communities, a national organization uniting communities to combat climate change and resulting social inequalities. Now, more action is being taken further north. Tampa — which has been ranked the nation’s metropolitan area most vulnerable to storm surge with $175 billion in potential losses — has formed the Tampa Bay Resiliency Coalition along with seven other counties and several city governments in the area, according to the coalition website. 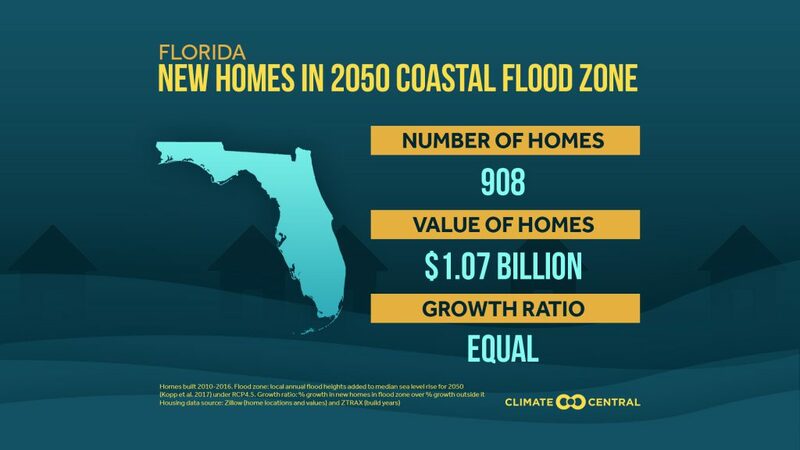 A look at the number of Florida homes built between 2010 and 2016 in the 2050 coastal flood zone, based on local annual flood heights and sea-rise projections. Housing data source: Zillow. Analysis by Climate Central. Local leaders agree with Adams that empowering their communities — organizing campaigns, advocating for sustainability measures and raising the profile of climate change in local politics – is a fundamental part of the work. “It’s the local governments that are the grownups in the room,” said Pinellas County Commissioner Janet Long, who helped initiate the Tampa Bay coalition. The Panhandle, too, is seeing more projects spread from city to city. 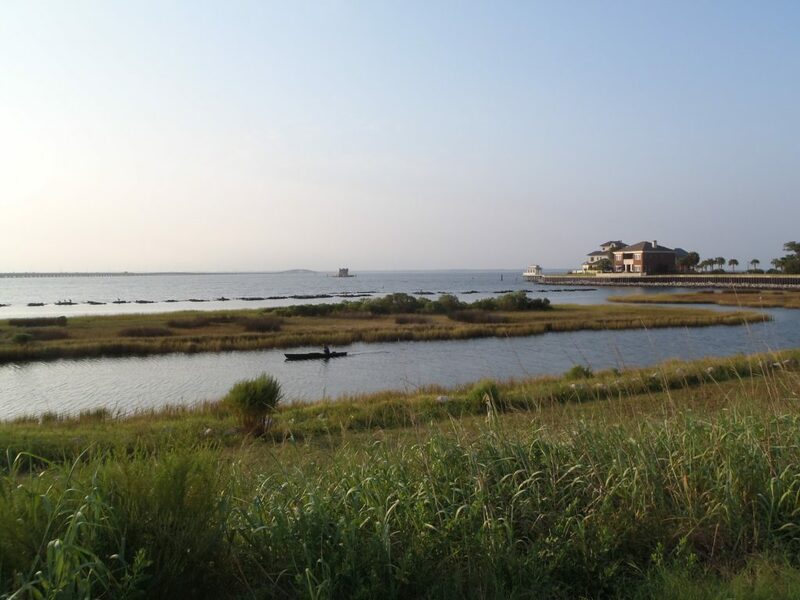 In Pensacola, Project GreenShores was an early, multimillion-dollar habitat restoration and creation project along urban Pensacola Bay that has proven its worth to protect the city in storms. The partnership among the state Department of Environmental Protection’s Northwest Florida Aquatic Preserves Program, the city of Pensacola and Escambia County also includes environmental groups, businesses and volunteers that work together to systematically restore oyster reef, salt marsh and seagrass habitat across the bay. Project GreenShores is one example of living shorelines projects underway across the Panhandle that rely on wetlands, oyster reef and other natural restoration to help protect property from sea rise and storms. Photograph by IFAS Extension. The project has helped the Panhandle become a hotspot for smaller living shorelines projects in coastal communities, according to ClimateCentral. Citizens incorporating living shorelines find natural solutions much more cost-effective than a seawall, with a price tag in the tens of thousands. “We want homeowners to see this as an alternative to a seawall,” said Alison McDowell, executive director of the Choctawhatchee Basin Alliance. 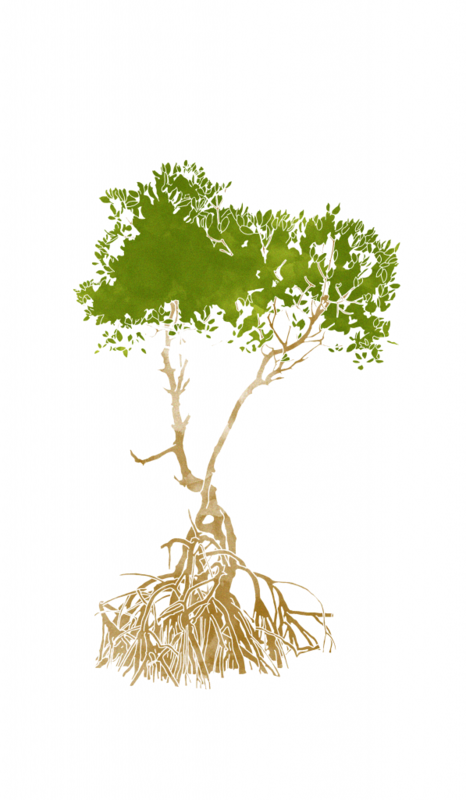 Community solutions to sea-rise are as diverse as Florida’s communities themselves. But what may be most important is being proactive. Researchers have found every dollar spent on disaster mitigation saves $6 in disaster relief.